I’m so excited about this. 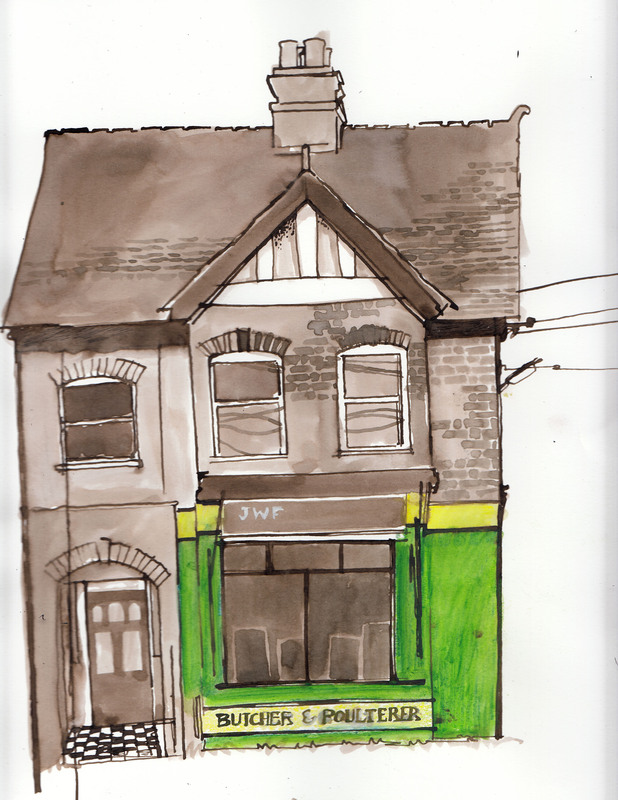 It is ‘re-worked’ from my original drawing and I like the brickwork and tiles. That’s how I wanted to do it when I was drawing it on location. It’s looser, more free and I’ve used a dip pen, which is so much better as the line is less controlled. OK the colour is wrong – an experiment in using some new ink-pencils (I’m trying to find methods of drawing like this whilst out on location)… and so that needs some work – I want something that is immediate, still transparent and ‘layerable’ as ink is, also waterproof once dry… hard to get many subtle colour arrangements mixing inks and it looks so different in the bottle; when mixing, how do you know what the colour will be on paper? Maybe I have to experiment with different kinds of ink. I love it so much as a medium I think it’s worth exploring this. So I am going to try again, in the comfort of my own home, getting the technique, materials and process right – then go back and see if I can draw it again on location. With a plan – do this first, then this, followed by this etc. It’ll be interesting to see how much measuring I need to do. I did a lot for the first drawing on location, and none for my re-working. I don’t think I am a naturally ordered thinker and I am discovering that I need to become one. Everyone always thinks that art is just this spontaneous act, this automatic outpouring, where in fact there is SO much discipline involved. Then there are a few pubs that have caught my eye – must be something about tiles and coloured window frames, lettering. So ‘whoopee-do!’ I’m happy that I’m happy drawing buildings! It’s been a bug-bear of mine for some time, and I think they are going to get better. So now this chap. I went life drawing today with the aim of producing a ‘sculptural’, tonal drawing. Thought I’d consolidate those drawings around my house, drawn in the dark; and continue my friendship with tone…. we had the perfect model. 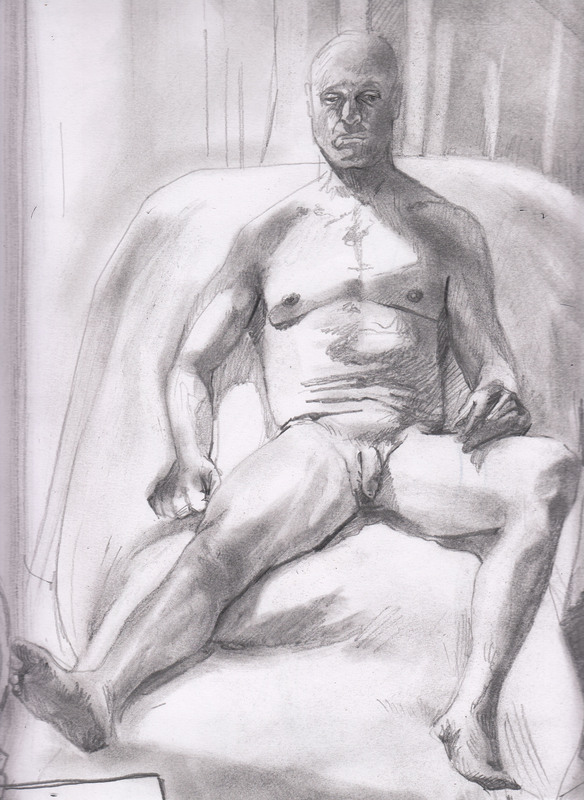 Very sculptural, and the life-drawing tutor always lights the figure nicely, so I could really get into the planes and form this very muscular model. Poses are also always long, which means I end up having to draw the face in some detail. Overall I like the result although I think I could have worked more loosely. Perhaps I should have used charcoal on sugar paper – with some white chalk or paint.. so that’s an idea for next time I go. The thing I really love though, and absolutely love, is his leg – the model’s right leg to be specific – it has come out so 3D. I feel I wouldn’t be too embarrassed to show that to Leonardo Da Vinci – I’m sure he’d find it wanting, however. Anyway, hand-in of this semester’s work is tomorrow! At least I’m feeling a lot more positive about it now, and I’ve learnt that there is such a thing a drawing ‘burn-out’. I think I had it in the final few weeks of the semester. Hopefully I will have learnt from it and will pace myself better next time, use my energy more wisely. It’s the first time I’ve done a course of study since having children; it is a balancing act I’m fine-tuning.